Аннотация к книге "On the sublime. Translated into English by H.L. Havell, with an introd. 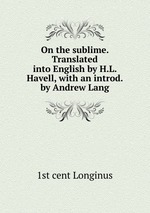 by Andrew Lang"